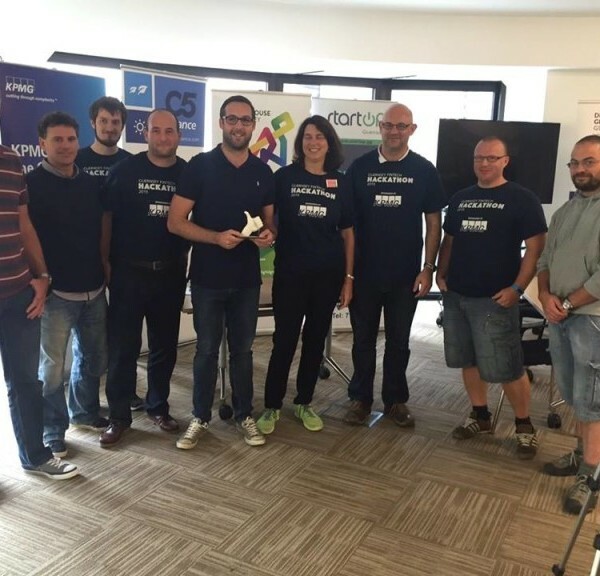 Team ‘Beanjar’, made up of C5 Alliance employees, has received plaudits for its money saving app which was announced the winner of Guernsey’s FinTech Hackathon event in October. The two-day event, hosted by Startup Guernsey and the Digital Greenhouse, took place on 9-11 October and saw individuals and teams from the island’s business, finance and technology communities gather at the i2 Offices in Guernsey to take part. The C5 team included Jon Le Noury, Tim Ogier, Simon Tidd, Matt Thornton, Richard Edwards, Marc Beavan and Mike Wade who worked all weekend on the challenge. With a tagline of “saving money has never ‘bean’ so easy,” they created an app to teach young people the principles and discipline of saving money at an early age to gain long term financial benefits. The app targets an audience of 5-16 year olds in a fun and simple way. The way it works is by the user inputting all the details about their money into an integrated saving platform as well as setting targets for their savings. In addition, the platform enables the user to receive recognition for some home tasks and chores. Marc Beavan, director at C5 and a member of the Hackathon team said, “We are indeed going to take the concept forward and plan to release all that was envisioned over the course of the weekend. Our initial release will include the spending laboratory, which will be used to teach children the concept of saving. Subsequent releases will include richer functionality, such as, a wish list of items and parental functions, whereby they can add and remove funds.